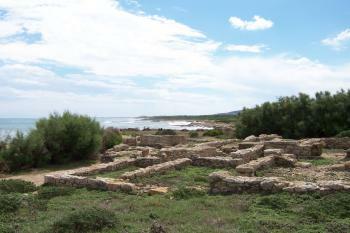 The Punic Town of Kerkuane and its Necropolis has the best ruins after the ancient Carthaginian country, as they were only partly destroyed. 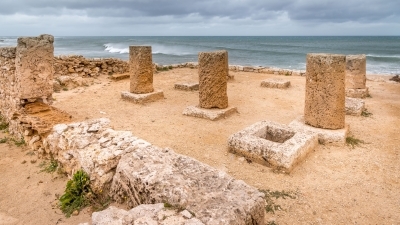 Excavations have revealed ruins from the 4th and 3rd centuries BC. It was probably abandoned during the First Punic War (c. 250 B.C.) and as a result was not rebuilt by the Romans. It has existed for almost 400 years. Around the site where the layout is clearly visible, many houses still show their walls, and the coloured clay on the facades is often still visible. The houses were built to a standard plan in accordance with a sophisticated notion of town planning. A sanctuary has some columns preserved, and in a small atrium parts of mosaics are found. Curbstones, doorsteps, thresholds, and floors of simple mosaic layers are found all over. I visit Kerkouane as part of my 2 week road trip in the northern half of Tunisia. (I ticked of all the WHS/TWHS there). Kerkouane is a 2.5 hour drive from Tunis or 3 hours from Sousse. I recommend visiting it on the way from Tunis to Sousse or the other way around. Saves you driving the same road twice and Cape Bon is nice to drive around too. It's a beautiful site and I really enjoyed walking around the site. It's only foundations left, which are in general from almost nothing up to over a meter high. The grid layout is good visitble and you get a good idea how the city must have looked like. Lots of plaster is in tact, mosaic floors (simple ones), and some houses have good signs with explanations and a 3D model how they must have looked like. Great way to explore. I recommend walking along the coast to the back, walk the small part through the bushes too, until the wall. Then turn right along that road that went to the sea. Then again right over the main road to the main square. This way you see all. The museum on the site is beautiful too. A small extra, go also to Kelibia Fort. It's nearby and you can manage it the same day. It's nice especially with kids. Kerkuane is one for the true collectors. The landscape is very nice in this part of Tunisia and I even saw some flamingo colonies on the way. Nevertheless, it is a bit hard to justify the combined around 5h drive to get there and back for what you see. The highlights are the bathrooms and a rather primitive mosaic. The rest are very low-level ground walls and a nice sea view. Opening times are very limited, closing at 4pm and closed on Mondays, so plan ahead. Just follow google maps to find the site. There is not much else around and very limited accommodation offers so I would not suggest staying overnight in this area. There are no motorways in this part of the country and many trucks. You will pass several cities, which further challenge your driving skills. This is a really nice site to visit, it is out of the way and situated on a great piece of coastline. There is not much left (everything is less that a metre in height!) but it provides a great example of Punic towns especially good if you have seen other sites in the country which did not fair so well under the Romans! 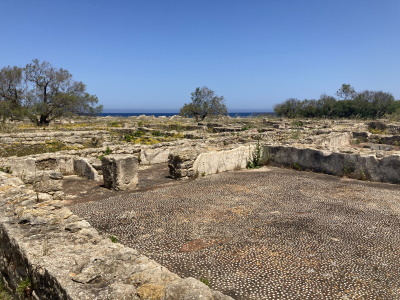 The site is right next to the sea and contains some features which you would not see at other archaeological sites such as the minimalist mosaics and almost fully intact bathrooms in every house. 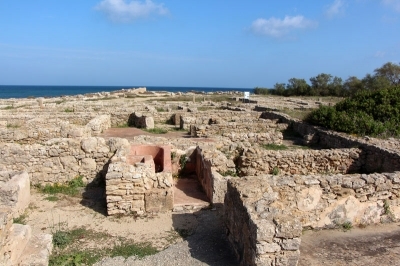 Built in the 3rd century BC: This Phoenician city was probably abandoned during the First Punic War (c. 250 B.C.) and as a result was not rebuilt by the Romans. The remains constitute the only example of a Phoenicio-Punic city to have survived (AB).